The number of Americans living in multi-generational households grew more than five times as sharply as the overall population increased from 2007 to 2009, the years that spanned the Great Recession. The largest increase was among adults ages 25 to 34 who live with their parents. In 2009, a record 51.4 million Americans lived in a multi-generational household. These households included one-in-six Americans (16.7%) and more than one-in-five (21.1%) adults ages 25 to 34. The share of Americans living in multi-generational households has grown by a third since 1980, when it was 12.1%. The growth, chronicled in a previous report by the Pew Research Center, represents a sharp reversal of the pattern from 1940 to 1980. From 2007 to 2009, the number of Americans living in multi-generational households grew by nearly 5 million, a 10.5% increase at a time when the overall population grew only 1.8%. About half of the increase since 2000 in the number of Americans living in multi-generational households took place from 2007 to 2009. The rate of growth was also twice the rate that had prevailed from 1980 to 2006. 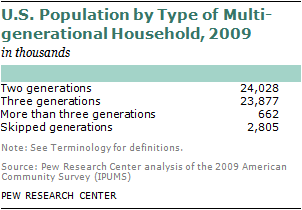 In 2009, there were 11.9 million multi-generational households in the U.S., up from 11 million in 2007. Most of these households (6.9 million) consist of two adult generations. The second largest group, 4.1 million in 2009, consists of three generations. A small number of multi-generational households (about 88,000) include more than three generations—for example, a great-grandparent, grandparent, parent and grown child. Some 857,000 are skipped-generation households, with grandparents and grandchildren living together. Roughly equal numbers of Americans lived in multi-generational households with two generations (24 million) or three generations (23.9 million) in 2009. The populations living in these households grew rapidly from 2007 to 2009—9.9% for two-generation households and 12.5% for three-generation households. The population living in households with more than three family generations is relatively small—about 662,000 in 2009. But the number of residents in these households increased the most—17.4%—from 2007 to 2009. There was no growth in the number of residents of skipped-generation households, 2.8 million in both 2007 and 2009. 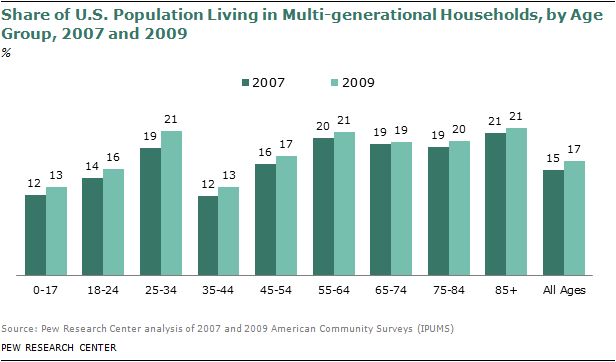 The number and share of Americans living in multi-generational households rose for all age groups from 2007 to 2009. The sharpest growth was among adults ages 25 to 34, 8.7 million of whom lived in multi-generational households in 2009, compared with 7.4 million in 2007. Both the numerical growth (about 1.3 million people) and the percentage increase it represents (16.8%) were larger than for any other age group. 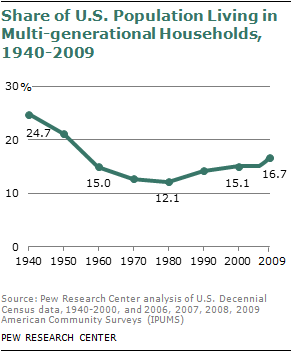 The share of these adults in multi-generational households rose to 21.1% in 2009 from 18.7% in 2007. That 2.4 percentage point increase also was larger than for any other age group. The profile of adults ages 25 to 34 living in multi-generational households differs from the overall population of Americans who do. Most notably, these adults are markedly more likely to live in two-generation households than in other types of multi-generational households. Six-in-ten (62.0%) do, compared with slightly less than half (46.8%) of the total population in multi-generational homes. 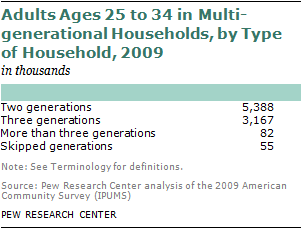 Most adults ages 25 to 34 in multi-generational households live in their parents’ home. In 2009, 79% of people in this age group who lived in multi-generational households were either the grown child of the householder or of that same generation, a group that includes spouses or partners of grown children. The share of adults ages 25 to 34 in multi-generational households who live in households headed by someone of their parents’ generation grew slightly since 2007, when it was 77.6%. A smaller share of these adults (12.7%) are heads of multi-generational households. Looked at in the broader context of population change, the number of adults 25 to 34 in multi-generational homes increased more sharply than their numbers overall: 16.8%, compared with 3.5%. One notable difference between adults 25 to 34 and the overall population in multi-generational households has to do with gender. Men living in multi-generational households outnumber women in this age group who do so (4.9 million to 3.8 million), but in multi-generational households overall there are more women than men. The next section looks in more detail at gender patterns. The share of 25- to 34-year-olds in multi-generational arrangements is similar to the share of adults ages 85 and older in such households (21.5% in 2009) and the share of older Baby Boomer adults ages 55 to 64 (20.9%). 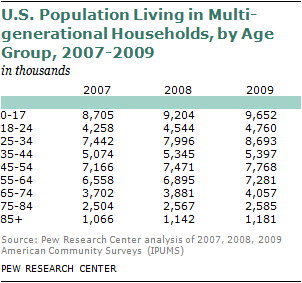 In the oldest age group, the number in multi-generational households rose more slowly, by 10.8% from 2007 to 2009. The number in the Baby Boomer group rose 11% from 2007 to 2009. The age groups least likely to live in multi-generational households are children under age 18 (13%) and adults ages 35 to 44 (12.9%). The number of males in multi-generational households rose 11.6% from 2007 to 2009, compared with a 9.6% increase among females, and grew more sharply in each of the four types of multi-generational households. The number of males grew most sharply in the relatively small category of the household where more than three generations live under one roof, increasing 18.8%, compared with 16.4% for females. In households where three generations live together, the number of males went up 13.2% and the number of females rose 11.9%. In two-generation multi-generational households, the number of males rose 11.3% from 2007 to 2009, while the number of females rose 8.4%. In the skipped generation grandparent-grandchild home, the number of males rose 1.1% while the number of females declined 1.2%. 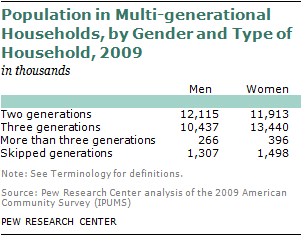 The number of males in multi-generational households grew by 2.5 million from 2007 to 2009. The growth was nearly evenly split between males in two-generation households and males in three-generation households, both up by 1.2 million. The profile of the typical male in a multi-generational household differs from the profile of the typical female. Half of males live in two-generation homes that house a parent or parents and grown child or children, while half of females live in households with three or more generations living under one roof. The only type of multi-generational household in which there are more males than females is the two-generation home in which grown children (or others of the same generation) live with their parents—12.1 million men, compared with 11.9 million women. Females greatly outnumber males in the other types of multi-generational households, especially the three-generation household, where there are 13.4 million females, compared with 10.4 million males. Females are more likely to be the head of the household, or of the same generation—40.2%, compared with 32.8% of males. Fully 12.1% of females are the parent of the head of the household, compared with 5% of males. These divergent roles within multi-generational households reflect both the larger population of older women and the greater tendency of young adult men to live with their parents. The nation’s major non-Hispanic race groups and Hispanics differ notably in how rapidly the multi-generational population has grown in recent years, as well as how likely they are to live in a multi-generational household and the type of household in which they live. From 2007 to 2009, the sharpest growth in the multi-generational household population was among Hispanics (17.6%) and Americans of two or more races (24.4%). The black population in these households grew by 8.7% from 2007 to 2009, the non-Hispanic white population by 8.5% and the Asian population by 7.3%. In all cases, this growth was more rapid than the overall population increase during this period, which was 6.5% for Hispanics, 14.7% for mixed-race Americans (that is, of two or more races), 1.5% for blacks, 0.4% for whites and 3.8% for Asians. 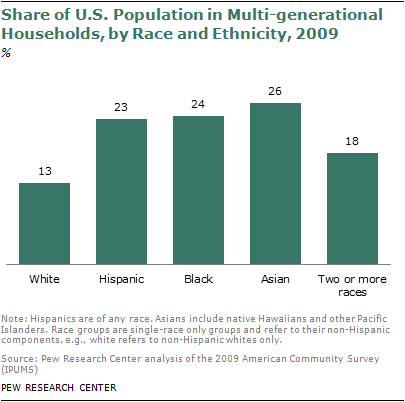 The most likely groups to live in multi-generational households are Asians (25.8% in 2009), blacks (23.7%) and Hispanics (23.4%). The share living in multi-generational households is notably lower for non-Hispanic whites (13.1%) and mixed-race Americans (17.9%). In terms of numbers, more whites (26 million in 2009) live in multi-generational households than do members of any minority group. But whites account for only half the residents of the nation’s multi-generational households, compared with 65% of the overall population. The most common multi-generational household type for whites is the two-generation home, which most commonly includes a grown child and at least one parent. More than half of whites (55% in 2009) in multi-generational households live in this type of household, the only racial or ethnic group for which this is the case. Hispanics account for the next largest number of residents of multi-generational households—11.3 million people in 2009. Among Hispanics, the three-generation family is the most common multi-generational type—58.7% of multi-generational household residents in 2009 lived in a three-generation household, and the number grew 20.7% from 2007 to 2009. Among Hispanics living in multi-generational households, nearly four-in-ten (39% in 2009) are the grown child of the head of the household (or someone in that same adult-child generation), a higher share than for other race or ethnic groups. That share rose by 2.1 percentage points from 2007 to 2009, a higher increase than for other groups. Among blacks, 8.8 million people lived in multi-generational households in 2009. About half of the black residents of multi-generational households—4.4 million—live in three-generation households. A notable difference between black Americans and other groups is that a higher share of black multi-generational household residents (9%) lives in skipped-generation households, most commonly where a grandparent is raising a grandchild. Among black residents of multi-generational households, 18.6% are the grandchild of the head of the household, the highest proportion among major race and ethnic groups. The number of black residents of skipped-generation households declined slightly from 2007 to 2009, while the number living in other types of multi-generational households went up. More than 3.6 million Asians lived in multi-generational households in 2009. The three-generation household accounts for just over half of Asian residents living in multi-generational households (52%); 1.9 million Asians lived in them in 2009. 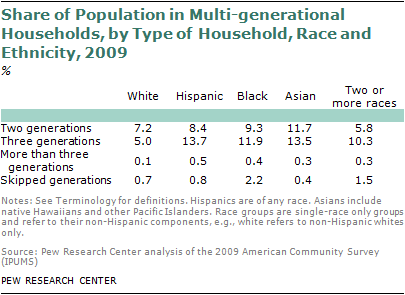 The number of mixed-race Americans in multi-generational households—about 981,000 in 2009—is relatively small. More mixed-race Americans live in three-generation homes than any other multi-generational type—57.8% of multi-generational household residents, or 566,000 people. Foreign-born Americans are more likely than native-born Americans to live in a multi-generational household, and from 2007 to 2009 their numbers in these households grew more rapidly. In this section, analysis is based on the birthplace of the head of the household, which offers a clearer picture than using the total household population because many homes include both immigrants and native-born (that is, U.S.-born) residents (for example, foreign-born parents and U.S.-born children). In 2009, 16.2% of foreign-born heads of household and 9.6% of native-born heads of household lived in a multi-generational household. From 2007 to 2009, the number of foreign-born heads of households living in multi-generational households grew 10.5%, compared with 7.7% growth among U.S.-born heads of households. Among both foreign-born and native-born heads of households, the most popular type of multi-generational household is the two-generation home of parent and grown child. Among foreign-born heads of households, 52.5% live in two-generation households, compared with 58.7% of U.S.-born household heads. The number living in two-generation multi-generational households grew 10.3% from 2007 to 2009 for foreign-born household heads and 8.1% for native-born household heads. Among foreign-born heads of households, the sharpest growth from 2007 to 2009 was in the relatively small category of homes with more than three generations, which grew 38.6% but numbered only about 24,000 in 2009. Among the U.S.-born, the three-generation household grew most sharply during that period (8.9%). There are notable differences between the foreign born and native born in the likelihood to live in a three-generation household or a skipped-generation household. Among those living in multi-generational homes, foreign-born household heads (44.0%) are more likely than the native born (32.3%) to live in a three-generation household. But among multi-generational residents, U.S.-born household heads (8.4%) are more likely than the foreign born (2.5%) to live in a skipped-generation household. From 2007 to 2009, the skipped-generation household actually declined in number and in share among foreign-born heads of households.